Happy are those in a country which invests billions of dollars in infrastructure; where unemployment is low; where social security and education are fiscal priorities; and whose natural beauty and cultural richness make it one of the most visited places in the world. If people are happy in this country, then they must be happy with close to a quarter of a million of their fellow citizens, from business owners to the homeless, dying from violent crimes in just over a decade. They must be happy with public infrastructure being sold and made inaccessible for the sake of profit. They must be happy with waters poisoned by foreign demand and resort towns becoming enclaves of wealth being serviced by a languished countryside. They must be happy in a country where clean water is scarcer than Coca-Cola, and whose obesity is among the most highest in the world. On July 1st, 2018, that country proved these assumptions false – they were not happy with the current state of affairs. The parties which have governed Mexico for 91 consecutive years, the National Action Party and the Institutional Revolutionary Party are warning their country and the world about the dangers of populism. Addressing the UN, the incumbent president, Mr. Pena Nieto, constitutionally barred from a second term, spoke of the threat short term and anti-evidence thinking pose to democracy. Characteristically unsubtle, he was pointing to the policies of the President-elect, Mr. Obrador. The established parties warn that kind of politics will lead Mexico into a situation now faced by Venezuela – where demonstrators are persecuted, democratic institutions are desecrated, judicial review corrupted, and economic activity halted. What is the national dignity, and should it matter? It’s the thing that is injured when a people are told that a multi-billion dollar airport is more valuable than their homes and the environment; when their children protest the government and then disappear; and when the rights of a narco-trafficker are more secure than a law-abiding rancher’s. Populism can seem to have no logic. Commentators often assert that it is fueled by the ignorance and desperation of people whom might believe they have more to lose if only they could be made to understand the ways of the world. However, the cause for the apparent meteoric rise in populism the world over can be traced to a logical beginning. It is the arrogance of the those who claim knowledge of global phenomena and patterns, those whose line of thinking has been recommended and pushed into actuality. Projections and estimates have been handed to the disadvantaged for a long time. Even concrete progress has been made to lift the most destitute of world’s population, whether they live in developed countries or otherwise. Yet the popularity of Trumpian style rhetoric and false promises are proving to be irresistible for some. That is because they feel the thoughtless march of globalisation and technology trotting over their accustomed life. 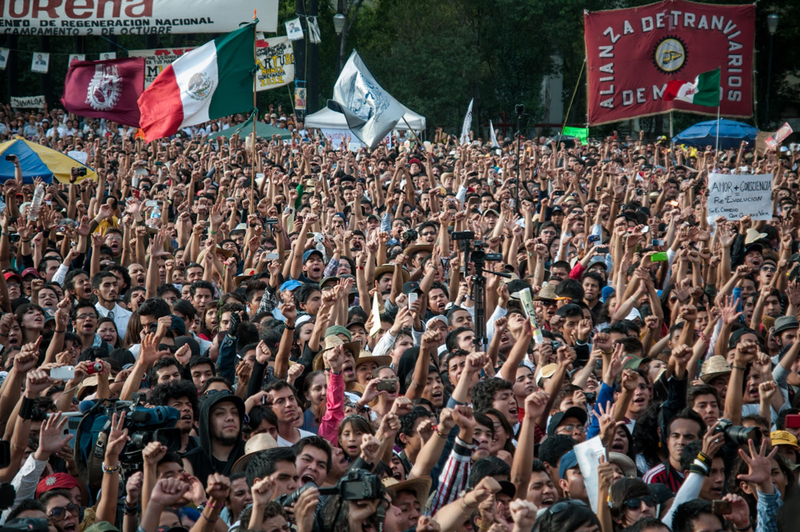 In Mexico, young and old, urban and rural, with a myriad of professions came together and shouted at the establishment, “basta ya” – enough is enough. From the factory floors of Nissan and Ford to the indigenous farmers: a broad alliance of people is forming. They are united in desperation. Some have wages high enough for more than subsistence but resent the waste and constant cost of corruption. Others are hopelessly underpaid or overworked, and risk deportation, detention or death crossing borders rather than continue their lives in Mexico. Though some have said Mr. Obrador’s plan is unrealistic, the people hear him, and recognise his intentions, as he has heard them and tailored his platform. The establishment parties did not take the challenge lying down, as spending was at an all time high (official spending anyways). They went all out in the three nationally televised debates and proposed many radical policies of their own, such as a universal income and a Mexican FBI. But they lost, just as those in the USA, UK, Italy and a growing list of western democracies. In the fight against populism, it is not so much what is being said, as much as who is saying it. People remember who fails to deliver them from their pains. More importantly, the people remember who tramples on their dignity.